October 1 is my favorite day of the year. It is the only day that doesn’t qualify for paid time off work that I celebrate religiously, every year. I realize that September 23 is technically the first day of fall, but September is so back-to-school! October is the first real month of fall, and thus, October 1 is the first true day of fall. And I love fall — duh! Every year, I celebrate October 1 as my fall-kick-off day, and every year it is fantastic. There are a few requirements to a successful launch date, and I’m about give you the lowdown on all of them. Rule number 1: Football. 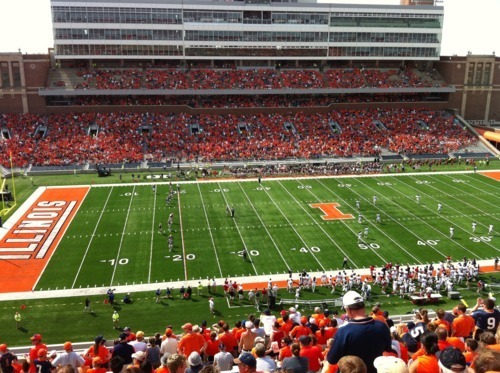 Nothing says the start of the best season ever better than a little bit of the best sport ever. It’s cuddling up in a cozy college sweatshirt, drinking a crappy beer, playing bags at your buddy’s tailgate. It’s never being too old to shotgun a beer and never being too young to know that even the crappiest of teams are worth cheering for. Rule number 2: Apple Orchards. I’ve already admitted to being a walking cliche so I feel no shame in saying that Apple Orchards are a mandatory component of the perfect fall day. I’m less interested in the actual picking of the apples, given that I’ve only actually done that once in my life, and more interested in the treats made from the apples that someone else picked. I go a little crazy in the apple orchard shop — I want it all. I can’t leave without a caramel apple, apple slushy, several jars of apple butter and usually a box of apple doughnuts to take home. Plus, the apple orchard makes for some of the cuttest pictures in the book!! 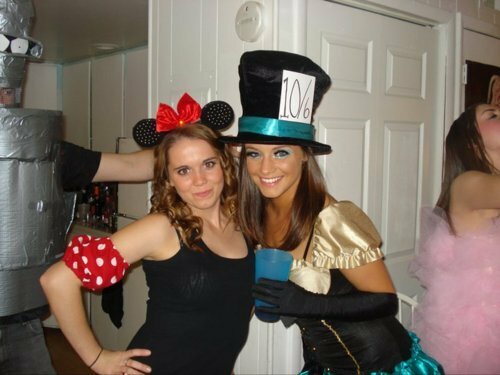 Rule Number 3: Halloween prep. I usually spend 11 months out of the year deciding what I want to be for halloween, so that come October 1, I can start buying the materials to build my costume. This year, the winner is Poison Ivy from Batman. I’ve decided to go for a more girly version than the classic comic book villain — my costume will inevitably be much sparklier than the original and definitely be paired with a great pair of black pumps. I haven’t quite decided on the details yet, but that’s what the trip to Walmart, Hobby Lobby and the costume shop are for! Check out last year’s beauty! Rule number 4: Get pump(kin)ed! Pumpkins are the star of the day. October 1 is the day to pick your favorite pumpkin and keep it by the front door. Personally, I’m partial to the short, stumpy kind, but to each their own! 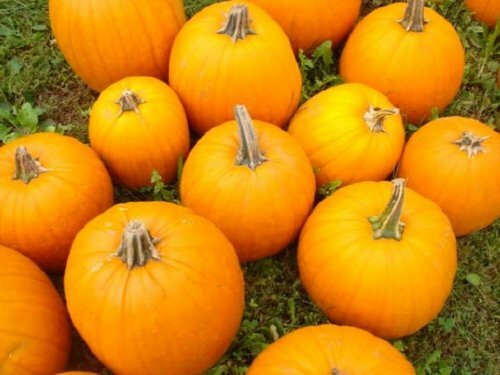 So pick your pumpkin, and while you’re at it, grab as many fake pumpkins as you can find to stick around your place to decorate! Preferably ones that sparkle! Grab a pumpkin spice latte and a good pumpkin bread recipe, and get on it!! I’m a firm believer that there are very few things short of chemical engineering that I can’t learn with a few free hours, YouTube and a decent internet connection. There’s no better testament to this than my recent adventures in being 80 years old — i.e. my love of crocheting. I had attempted to crochet once a few years back, but ended up with nothing but a half-finished scarf that was starting to look more like a really tall acute triangle than a rectangular scarf. I decided to pick up crocheting again a few weeks ago while I was in the process of moving from Champaign, IL to Chicago. With at least five round trips slated in a one-week period, I figured I’d try to keep myself busy. 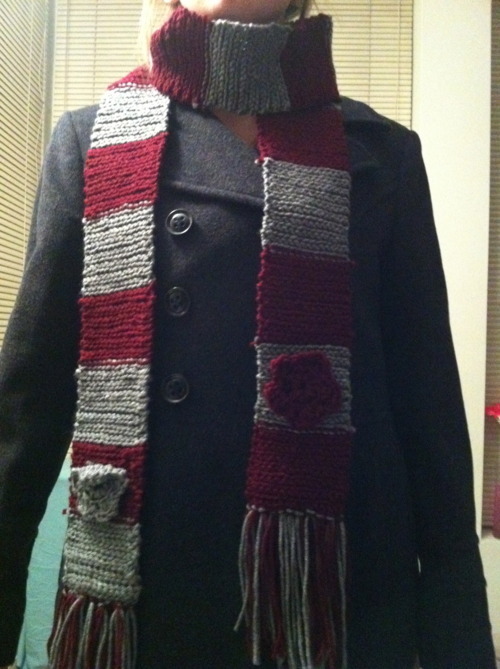 I ended up with this: my first scarf. By the time I finished my scarf, I started to realize that there was probably nothing made of fabric that I couldn’t crochet, given the time and right color of yarn. My first plan was to try my hand at placemats…which inevitably led to matching coasters and napkin rings. Next, I branched out to cozy cups (I think that’s what they’re called —those things that keep cans of beer cold), which I personally thought were pretty darn cool! After that, I kind of went on a coaster kick — I made circles, I made squares, I made pumpkins, I made snowmen, I made country flags, and of course, I made my fall favorite: apple coasters. In the spirit of my favorite season, I want to share with you my favorite craft. It’s possible that I’ll share my snowmen come December and something bright and colorful by May, but let’s focus on the present for now. I started taking pictures and video of myself as I made my autumn table gear, but decided I should probably leave that in the hands of the teachers that taught me. So follow my step-by-step guide, complete with links to the tutorials I used. 1. Using the white yarn, crochet a spiral out to 3 complete rings. Follow this step by step guide here. 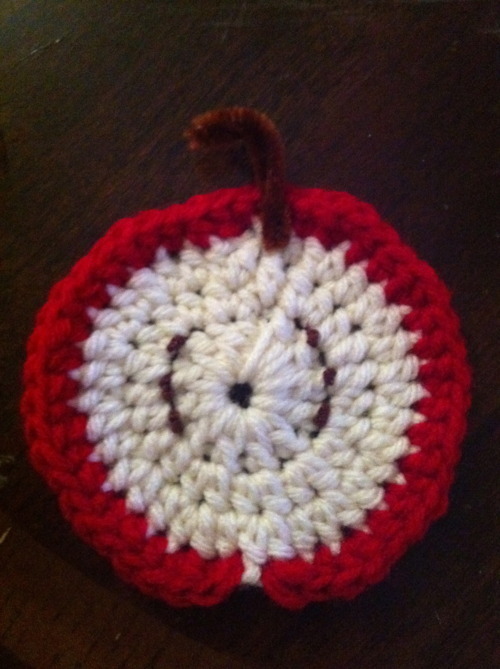 I found it incredibly easy to follow — easier than most videos on crocheting a spiral. There are just a couple terms you’ll need to know. Chain, slip stitch, double crochet (dc) and half double crochet. They’re super easy if you watch these short videos. 2. Pick any stitch of the circle as a starting point. 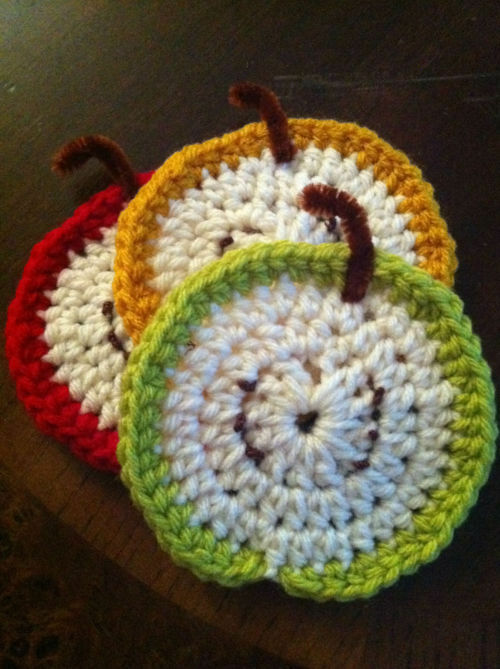 Use your red, yellow or green yard now and half double crochet around the whole circle following the pattern of 2 half double crochets in every fourth double crochet stitch. When you get two stitches away from your starting point, do one last half double stitch, followed by a slip stitch as a final stitch. 3. Finish your project. I follow this video, but use my hook instead of the needle. 4. Cut 6 pieces of brown embroidery floss about 6 inches long. Tie a double knot in the middle of each strand. Tie each on onto the yarn with the double knot in the front. Trim ends on the back. 5. Cut a piece of pipe cleaner about 2 inches. Bend a little at the top and twist around the yard to make a stem. Nothing pairs with a Starbucks caramel apple spice from better than a silky pair of tights, adorable heels and a flowy skirt. And I always dress to the occasion! While I do carry tights into the winter months, I prefer to get the majority of my tights wearing out of my system early. Not because I get sick of them, but simply because I hate being cold. As cute as tights are, they’re definitely not the most practical thing to wear when there’s snow up to your knees (and let’s be real, I live off Lake Michigan — that happens, alot). So I try to capitalize on my favorite trend between the temperatures of 35 and 60 degrees. I’m a fair-weather tights fan, I suppose. 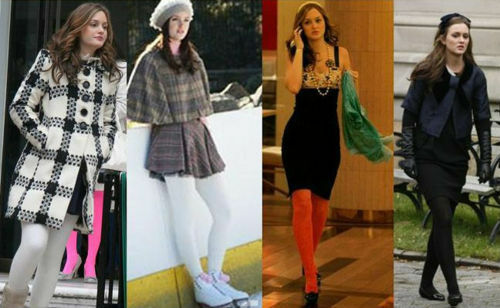 So you can image my delight when I turned on Gossip Girl Season 1 last year (because I’m way behind in pop culture) and saw that the lovely Blair Waldorf adorned tights on a nearly weekly basis! Jackpot! I was officially “in.” And lucky for me, tights have been trending for the past few seasons, so I can only hope I’m still up to par this fall. But either way, I have every intention of wearing them every other day regardless. I sported my second favorite fall outfit to work today. A high-waisted black skirt (Miley Cyrus’ line to be exact), solid black tights, my all-time favorite flats (courtesy of the lovely Kayiu), and tucked-in plain white T. Why my second fave outfit, you ask? Because Saturday is October 1 — my favorite non-holiday day of the year. 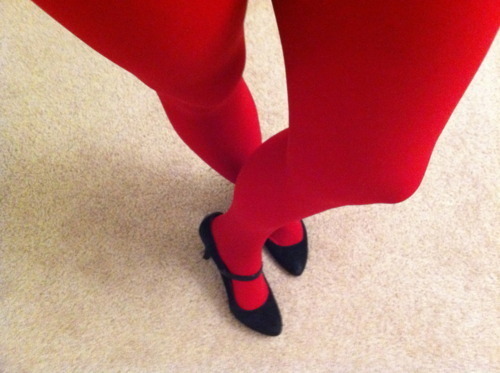 It’s my annual day to idolize fall and all of its loveliness…straight down to the tights! So I’m saving my number one for Saturday. But more on that later! The only thing I love more than coffee is coffee perfectly paired with a delectable dessert. Working at Starbucks for six years taught me a lot of things and how to create a perfect pairing was definitely one of the most important. Since I no longer rock my green apron on a daily basis, I decided that I had to uphold this practice in my own home. 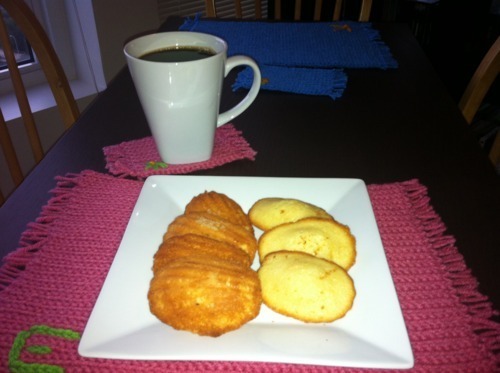 Today I decided to go with my favorite coffee, Starbucks Casi Cielo and pair it with my favorite French cake/cookie, Madeleines. Casi Cielo was specially designed by Starbucks as a dessert coffee. It’s a smooth and balanced Guatemalan coffee with hints of lemon and cocoa flavors. When paired with the subtle sweetness of the Madeleines, you really notice the citrus in the coffee and the vanilla in the Madeleines. I found this recipe on Joy of Baking, and it has never failed me. Enjoy!! First, melt the butter and allow it to cool while you make the batter. In a small bowl place the flour, baking powder and salt and whisk until well blended. In the bowl of your electric mixer, beat the eggs and sugar at medium-high speed until the mixture has tripled in volume and forms a thick ribbon when the beaters are lifted (about 5 minutes). Add the vanilla extract and beat to combine. Sift a small amount of flour over the egg mixture and, using a large rubber spatula, fold the flour mixture into the beaten eggs to lighten it. Sift the rest of the flour over the egg mixture and fold in being sure not to over mix or the batter will deflate. Whisk a small amount of the egg mixture into the melted butter to lighten it. Then fold in the cooled melted butter in three additions. Cover and refrigerate for at least 30 minutes, or several hours, until slightly firm. 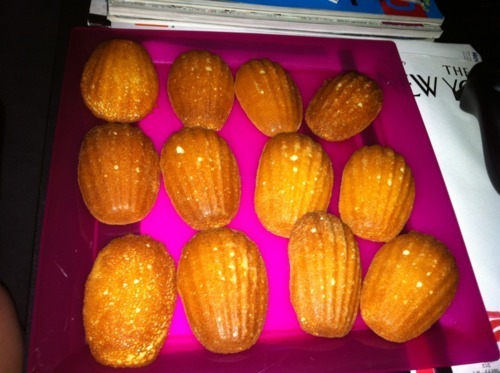 Bake the madeleines for 11 to13 minutes, until the edges are golden brown and the centers spring back when lightly touched. Do not over bake these cookies or they will be dry. Remove the pans from the oven and rap each pan sharply against a countertop to release the madeleines. Transfer the madeleines, smooth sides down, to wire racks to cool. The madeleines are best served the same day but can be stored in an airtight container at room temperature for 2 to 3 days or frozen, well wrapped, for up to 1 month. Makes about 24 – 3 inch madeleines.